In 2012, a three-year study was commenced to investigate reproductive loss on the arid rangelands of Old Man Plains Research Station (OMP) (ref. 1). Many of this study’s findings have been consistent with those in a large Meat and Livestock Australia-funded CashCow research project (ref. 2), for example, pregnancy-to-weaning reproductive loss within the 25—75 percentile range for the Northern Downs (3 to 15%) and Northern Forest (9 to 19%) regions of northern Australia. Multiple factors have been associated with foetal and calf losses. Some calf losses can be directly or indirectly reduced with strategic management. As a prelude to the summary report for the three-year study, some interim findings were presented in a poster at the 2016 North Australia Beef Research Update Conference (NBRUC) (ref. 3). 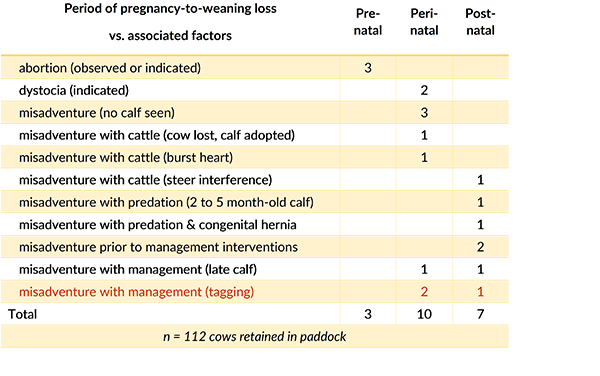 This poster showed the multi-faceted nature of the risk factors associated with the 18% foetal and calf loss between confirmed pregnancy and weaning in year 1 (Table 1). Of these losses, 17 occurred after calving (15.2% peri- and post-natal losses), including deaths associated with a muster for calf-tagging, i.e. peri-natal calf loss as a result of predation or dehydration (heat stress) during prolonged separation from the recently-calved cow (Figure 1), and post-natal calf loss as a result of failure to securely ‘mother up’ again. Table 1. Periods of reproductive loss, with associated factors in the first year of 3-year study. After adoption of a ‘package’ of modified muster activities in years 2 and 3 of the study, no further calf loss was attributed to ‘muster for calf-tagging’. The modified activity ensured: no overnight trapping; no yarding of cows with large udders if ‘running back to the paddock for a calf’; drafting of calves to rapidly process; and holding of cows and calves outside the yard to ‘mother up’ afterwards. These findings indicated that modification of muster activities can decrease muster-related risk of calf loss. This is relevant to those central Australian cattle properties with continuously-mated, year-round calving herds that may not always be able to avoid musters during a calving peak. For enquiries, please contact Jocelyn Coventry, ph. 08 89518142. Coventry, J. 2012, Investigation of reproductive loss, (NT) Department of Primary Industry and Fisheries, Alice Springs Rural Review, 50 (September 2012), pp.1, 3. McGowan, M., Fordyce, G., O’Rourke, P., Barnes, T., Morton, J., Menzies, D., Jephcott, S., McCosker, K., Smith, D., Perkins, N., Marquart, L., Newsome, T., Burns, B. 2014, Northern Australian beef fertility project: CashCow, Final report, Project B.NBP. 0382, Meat and Livestock Australia, North Sydney, N.S.W., 300 p.
Allan, C., Coventry, J., Gill, B., Sims, S. 2016, ‘Modified management to minimise calf loss at muster’ in Proceedings, Northern Beef Research Update Conference, 2016, Rockhampton, Q. (Ed. E. Charmley), p. 201.